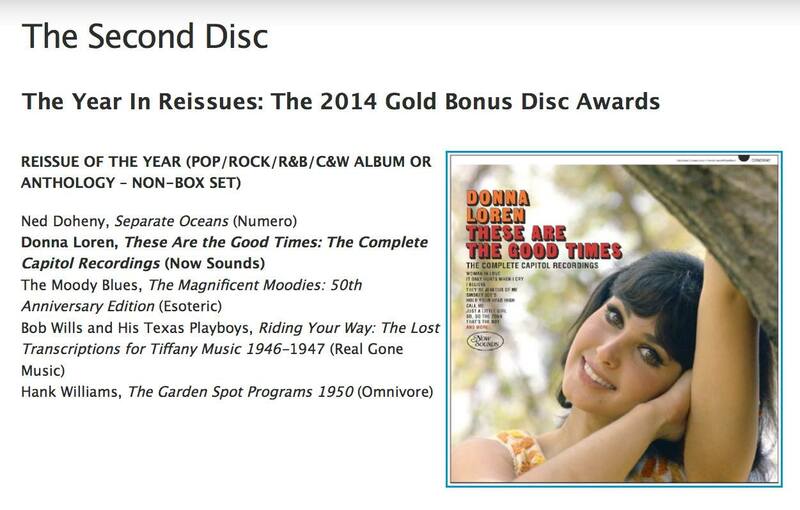 The Second Disc has awarded the "REISSUE OF THE YEAR (POP/ROCK/R&B/C&W ALBUM OR ANTHOLOGY – NON-BOX SET)" for Donna Loren's "These Are The Good Times: The Complete Capitol Recordings"! Congrats to Ms. Loren and Now Sounds Records. "Yet Now Sounds takes the Gold Bonus Disc for a release that lives up to its title: Donna Loren’s These Are the Good Times. Featuring the cream of the crop of L.A.’s Wrecking Crew (including Hal Blaine, Carol Kaye, Glen Campbell and Leon Russell) and some of pop’s greatest talents (Goffin and King, Mann and Weil, Jack Nitzsche, Randy Newman, Jackie DeShannon), These Are the Good Times is an ingenious album that never was – with period-perfect design, excellent liner notes and crisp remastering. Though Loren only had one Capitol album to her name (Beach Blanket Bingo, which is also included in full on this disc), it wasn’t a true indicator of her talents. This creative, cleverly-compiled and beautifully-presented to her discography makes for an invigorating discovery."